Mary Shutters weighs salmon to be packaged in the processing room of Ducktrap River of Maine in Belfast. Ducktrap River of Maine is marking its 40th year of smoking fish on the Maine coast with a $5 million expansion that will increase its production capacity by 75 percent. With 160 workers, its one of the city's largest employers and poised to grow. These days, it seems as if just mentioning the word “salmon” in Waldo County can set off fisticuffs, as emotions continue to ride high about whether or not Belfast is a good spot for a multimillion dollar land-based salmon farm. But within city limits, another company is quietly turning salmon and other fish into both a delicacy and a profit. Ducktrap River of Maine is marking its 40th year of smoking fish on the Maine coast with a $5 million expansion that will increase its production capacity by 75 percent. And no matter what happens with the proposed land-based salmon farm, at Ducktrap, salmon is king. 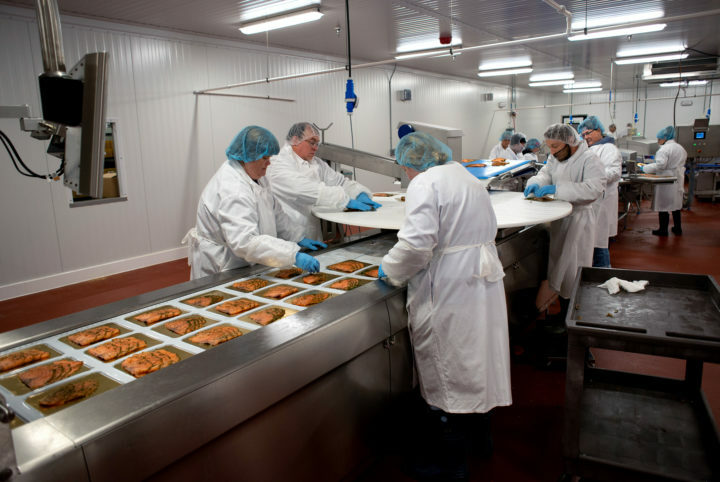 That’s because salmon, both wild-caught and farm-raised, makes up the lion’s share of the fish that is processed at the venerable Belfast smokehouse. Every week, the company processes more than 100,000 pounds of fish, and about 80 percent of that is salmon, the succulent, oily fish that is shipped to Waldo County from all over the world. Some of that salmon recently made its way through one of the company’s chilly production floors. 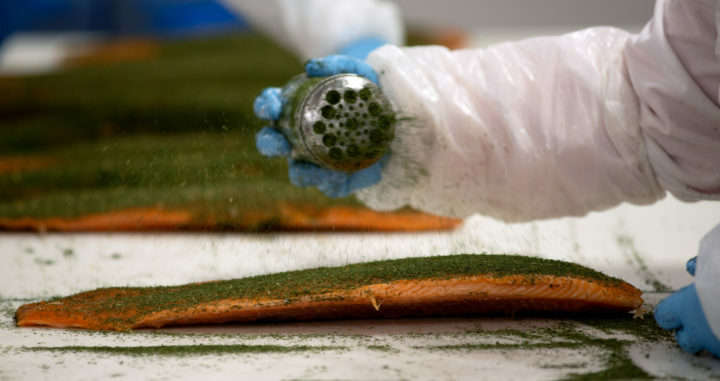 Men and women garbed in rubber boots, protective suits and hair nets made sure the brined and cold-smoked salmon was sprinkled with a judicious amount of dill and other spices before being weighed and packaged for distribution. New machines have automated much of the process, slicing and weighing the pink, herb-topped fish that raced on a conveyor belt through the room, although people were still present every step of the way. Don Cynewski , general manager, pulls out a tray of cold-smoked Chilean farm raised salmon at Ducktrap River of Maine in Belfast. Ducktrap River of Maine is marking its 40th year of smoking fish on the Maine coast with a $5 million expansion that will increase its production capacity by 75 percent. With 160 workers, its one of the city's largest employers and poised to grow. “This is definitely a step up, with more modern technology,” said Don Cynewski, general manager of the company. The new machines are located at the heart of a state-of-the-art, 50,000-square-foot smokehouse that recently opened in a Belfast Business Park facility that had been vacant since 2016, when Little River Apparel closed for good. The major expansion should allow Ducktrap to increase its production capacity by 75 percent, the general manager said, adding that it couldn’t open soon enough. Globally, demand for salmon has been rising during the past several decades, he said, with the smoked salmon market keeping pace. 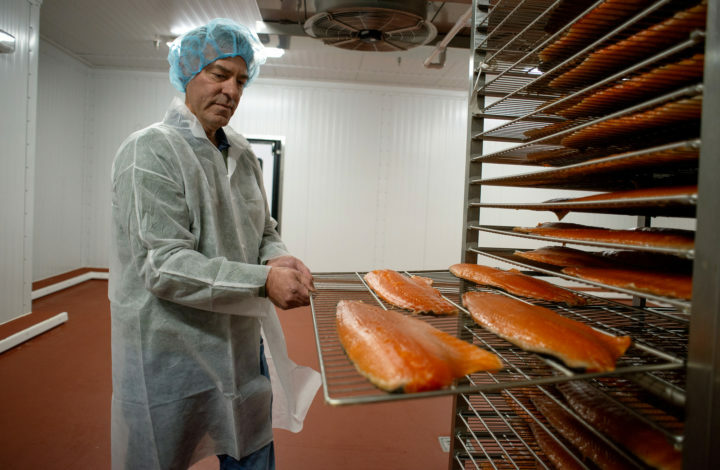 Ducktrap of Maine, owned by Norwegian-based international firm Marine Harvest, is positioning itself to keep up with the growing hunger for smoked salmon and other fish. Opening the new production facility is just the latest chapter in Ducktrap’s 40-year history, one that has been marked with ups and downs but has seen steady growth in the past 10 years. 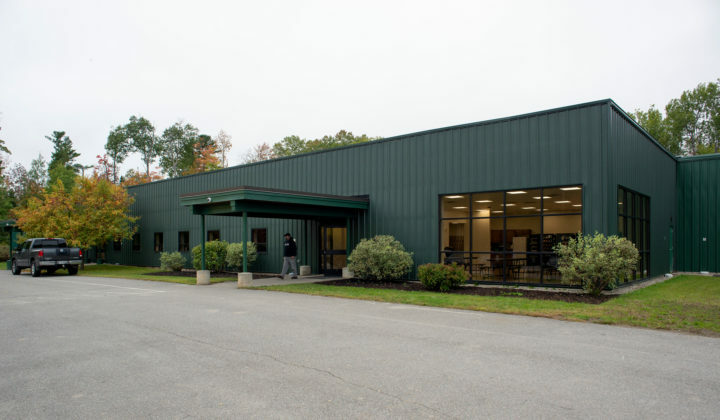 Ducktrap River of Maine is marking its 40th year of smoking fish on the Maine coast with a $5 million expansion that will increase its production capacity by 75 percent. With 160 workers, its one of the city's largest employers and poised to grow. The company was started by Des FitzGerald, a Maine man with a dream and a plot of land on Kendall Brook in Lincolnville. He wanted to farm trout, and in 1978 built several water runs and commenced trout farming on a small, local scale. Fitzgerald named the company the Ducktrap River Fish Farm after the river into which Kendall Brook flowed, but soon learned that trout farming also was attractive to the otters, raccoons, skunks and owls that shared the neighborhood with him. FitzGerald sent away for a booklet from the government on how to build a smoker and smoke fish, according to the company’s history. He built a small smokehouse, buried an old wood stove in the ground beneath it and got to work. As it turned out, he was better at smoking the fish than farming it, and the product caught on locally, then beyond. Ducktrap grew throughout the 1980s and in 1991, the production was moved to a then state-of-the-art facility in Belfast, which allowed it to increase capacity and keep quality high. Still, in the 2000s, Ducktrap fell into some hard times, Cynewski said. The company had been sold to a big American agribusiness firm in 1999, and in 2001, that company merged with Fjord Seafood, a Norwegian-based enterprise. By then, Ducktrap was heavily involved in farming Atlantic salmon in pens off the coast of Washington County, and the aquaculture side of the business was proving to be troublesome, Cynewski said. At one point, 100,000 farmed salmon escaped, and $10 million worth of fish died over one frigid, costly winter. Lawsuits were filed, and it just seemed like the company couldn’t shake a run of bad luck, trouble and instability. In 2007, Fjord was one of three seafood companies that merged to form Marine Harvest, which has operations in countries all over the world. That’s when things began looking up for the smokehouse on the Maine coast, the manager said, adding that Ducktrap divested itself of the aquaculture side of the business and focused on smoked seafood. In the processing room of Ducktrap River of Maine in Belfast. Ducktrap River of Maine is marking its 40th year of smoking fish on the Maine coast with a $5 million expansion that will increase its production capacity by 75 percent. With 160 workers, its one of the city's largest employers and poised to grow. Today, Ducktrap employs 160 full-time workers and is the second largest smokehouse in the country. 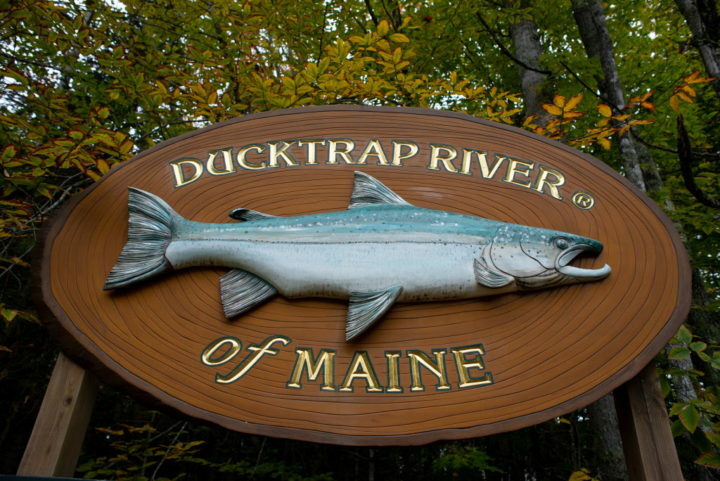 It aims to be a part of the global economy while still keeping its Maine roots intact and changed its name to Ducktrap River of Maine to try to capitalize on that connection. 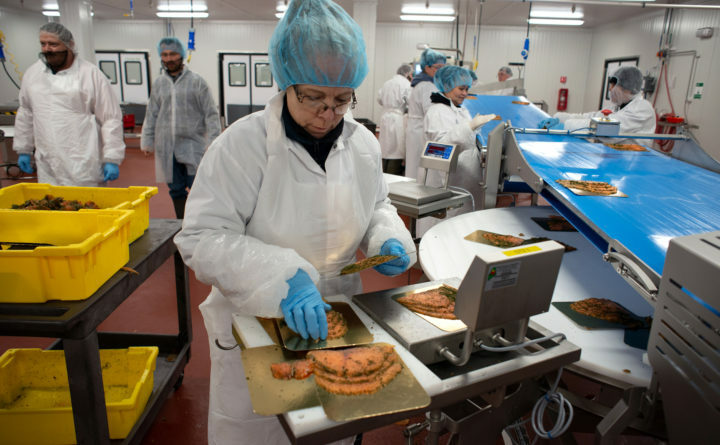 Because cold-smoked fish is a raw food product considered similar to sushi by food safety regulators, workers need to take careful precautions when preparing the product. Frozen fish is first thawed for a day before being brined in a salt solution. Then, it’s placed in the cold-smoke kilns at 82 degrees or so Fahrenheit for eight to 10 hours, and is smoked over locally sourced hardwoods and fruitwoods, Cynewski said. Altogether, it’s a three-day process to bring the fish from frozen to finished. Smoked salmon from Ducktrap can be found all over the country, at stores including Hannaford, Trader Joe’s and Whole Foods Market, the company’s single-largest customer. Belfast, ME — October 4, 2018 — Tracey Larby seasons smoked salmon in the processing room of Ducktrap River of Maine in Belfast. Ducktrap River of Maine is marking its 40th year of smoking fish on the Maine coast with a $5 million expansion that will increase its production capacity by 75 percent. With 160 workers, its one of the city's largest employers and poised to grow. “You would have a hard time finding a Whole Foods without Ducktrap in it,” Cynewski said. A lot of the salmon smoked at Ducktrap is sourced from Chile, although the company also gets the fish from Norway, Scotland, Iceland and Canada. Trout comes from Colombia, Chile and Argentina, where the Maine smokehouse is the sole customer at one trout farm. With a Norwegian parent company and sales around the country and beyond — 95 percent of the product smoked in Belfast is sold outside of Maine — there’s no denying the fact that Ducktrap’s smoked fish is an international enterprise. And yet, so far Ducktrap seems to have avoided the furor over a proposed Norwegian land-based salmon farm that has roiled the city of Belfast since plans for it were announced early this year. The rhetoric outside the smokehouse may get heated about salmon farms and internationally owned corporations, but inside it’s business as usual.